Keep Your Garden Growing with a Coldframe! Your garden may be winding down for the winter, but it doesn’t have to! A simple cold frame can provide a perfect micro-climate for growing vegetables to extend the garden season. 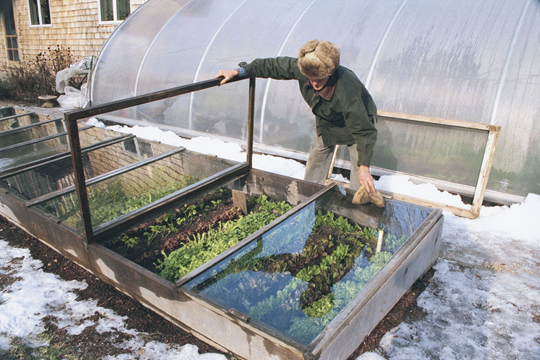 A cold frame, like the one pictured above, is essentially a bottomless box that sits right on the ground. It should face south so the slanted glass door on the top will allow sunlight to heat things up. You can actually start sowing seeds of your cold frame crops, such as scallions, chard, parsley, escarole, endive, dandelion, radicchio and carrots as early as mid-summer. If inspiration to start a winter garden hasn’t come until now, try planting arugula, mâche (a salad green), spinach, claytonia, radishes, and lettuce, and in just a few weeks, you’ll have a fresh harvest! Keep in mind the temperature inside the cold frame should remain below 60°F during winter days. Simply lift and prop up the lid 6″ when the temp is supposed to go above 40°F during the day. You can even install temperature-activated ventilating arms to make easy work of it. Add a bit of insulation (old blankets, straw, newspaper, etc.) on top of the glass lid on really frigid nights. A light layer of snow on the lid is okay for several days. You can even overwinter tender or tropical plants in a cold frame! Cold frames are also useful for growing seedlings of arugula, beets, broccoli, cabbage, chard, kale, radish, scallions and spinach in late winter. In early spring, sow seeds of peas, bulb onions, potatoes or even tomato seedlings. Be sure to water your cold frame plants about once a week, or open the lid on rainy days. During summer, if your cold frame can be repositioned, face it north to protect and encourage fall and winter flowering plants. The temperature inside should stay below 75°F during summer. Keep it growing with a cold frame!